Last week I went to a class at the Sydney Fish Markets put on for the media by SunRice. Our teacher for the morning was the delightful Poh Ling Yeow, the company’s ‘brand ambassador’ among other, greater claims to fame. Let me say up front, I love Poh. After years of writing Kitchen Spy for the Sydney Morning Herald, interviewing celebrity chefs and lesser mortals, Poh remains a favourite. She’s smart, talented, funny, self effacing and, most endearingly, real. She’s the full package. 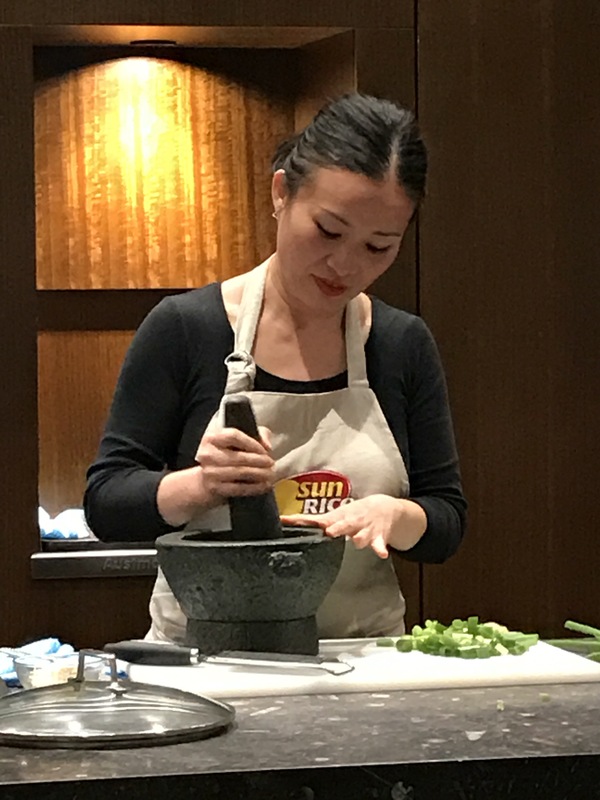 So we all piled into the demo kitchen where Poh conjured a particularly fragrant Hainan Chicken Rice then moved into the real kitchen, formed teams of four and made Fish Pineapple Curry. I know there’ll be readers shuddering at the pineapple idea but don’t. We’re not talking canned Golden Circle in syrup. We are talking fresh, firm and tangy, the perfect foil for the rich coconut cream base. 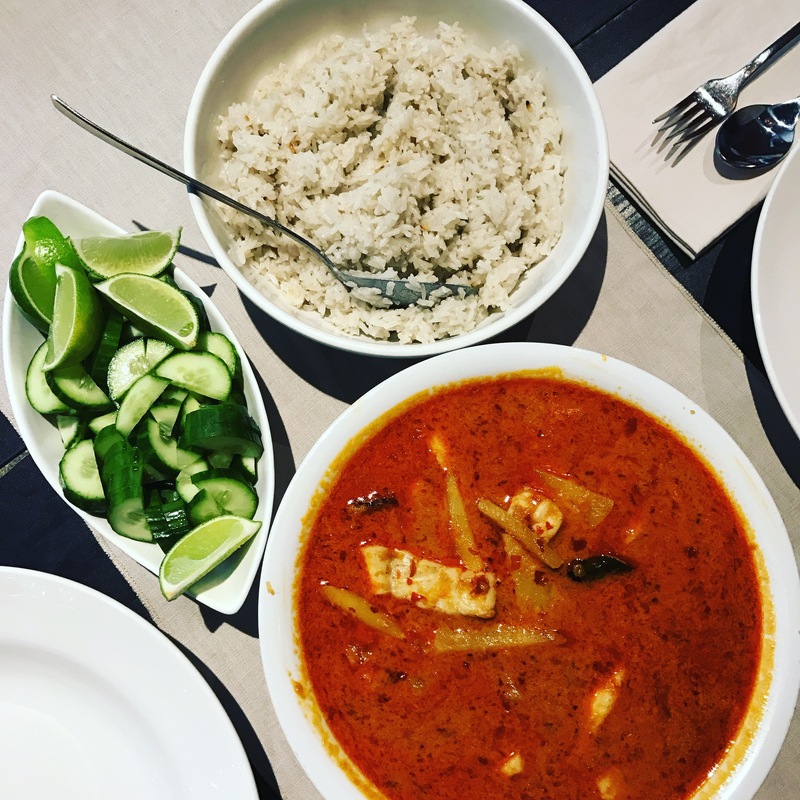 Poh credits a Malaysian aunty with this recipe which is an absolute cracker. It’s everything I love about Nyonya cooking. Hot, sour, salty, sweet yes but it’s also complex, gutsy and smells better than Chanel No 5. To make the curry, blitz all spice paste ingredients except the oil in a blender until smooth. Heat the oil in a large, heavy based saucepan or wok over medium heat and cook paste for until it’s caramelised and fragrant. This could take more than 10 minutes. You’ll know it’s ready when it stops smelling raw, thickens, deepens in colour and the oil floats on top. Add the pineapple, water, tamarind slices, kaffir lime leaves and bring to the boil. Reduce heat to simmer for another 10 minutes. Add coconut milk, salt and sugar and return to the boil, then add fish at the very end to cook for 5-10 mins until cooked through. Taste just before serving. More salt, sugar or lime may be required to balance the flavours. To make the rice, combine it with the pandan leaf, water and coconut milk in a medium non-stick or well seasoned saucepan. Bring to the boil then cover and reduce the heat. Simmer for another 10 mins, then remove from heat and allow to rest another 15 mins before fluffing up with a fork. You can find pandan leaves fresh or in the freezer in most Asian grocers. The fresh are better. The dried ‘tamarind’ slices are not related to tamarind, by the way. They’re the dried fruit of the gelugor tree, and may be labelled ‘asam gelugor’ which means sour slices. If you can’t get them use tamarind! Further to my little rave about Peter Gordon’s Savour cookbook, I thought I’d share with you his miso roasted eggplant / aubergine recipe. Although he makes it as part of an elaborate salad with Medjool dates, feta and crisp buckwheat I like it enough to make it as a simple side dish. And the really good thing about it is it’s ridiculously easy and works just as well on other vegetables. I roasted thick sweet potato slices with the same coating to serve with roast chicken the other night and it was the bomb – even the leftovers, cold from the fridge, were fab. So here you go miso lovers, get onto this. Preheat the oven to 180 C. Mix the miso paste with the mirin to loosen it, then stir in the oils. Brush the mixture on the cut surfaces of the chosen vegetable and sprinkle with sesame seeds. Place on a baking sheet and bake for 20-30 minutes. The eggplant is cooked when you can squeeze it with little resistance. If you’re using sweet potatoes, poke with a skewer to check for tenderness. I reckon this coating would be great on ordinary potatoes, pumpkin or even asparagus. Let me know if you try it or think there’s anything else that might happily roast in it. 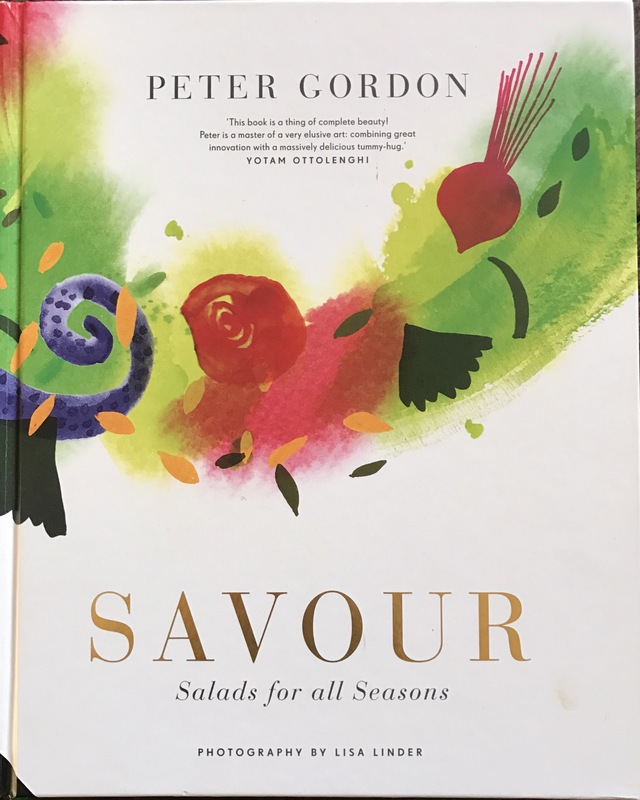 I’ve been reviewing salad cookbooks for The Real Review and Savour, Salads for all Seasons from chef, Peter Gordon has me entranced. Let’s get one thing straight: these are no ordinary salads. They’re imaginative with a keen eye on texture and punchy flavours but, hey, Yotam Ottolenghi and Karen Martini have been flying those flags for years. These ones are different. Gordon’s efforts at first, and even subsequent, glances might seem like a bit of a palaver. Only the first chapter, Simple Salads, actually is. And although these ones are straightforward, they’re never boring. Here he does a red salad with grilled red capsicum, radicchio, tomatoes, beetroot and pomegranate and sesame seeds all dressed with a tangy, chili-spiked vinaigrette. That pushes all kinds of buttons, right there. The rest of the book is all multi-staged extravaganzas divided into chapters including cheese, seafood, grains, poultry and meat. There are so many upsides to these though; with many of them, you probably won’t need to serve anything else, they’re very forgiving of omissions and substitutions and they teach you little tricks that you can apply to other, more simple affairs. 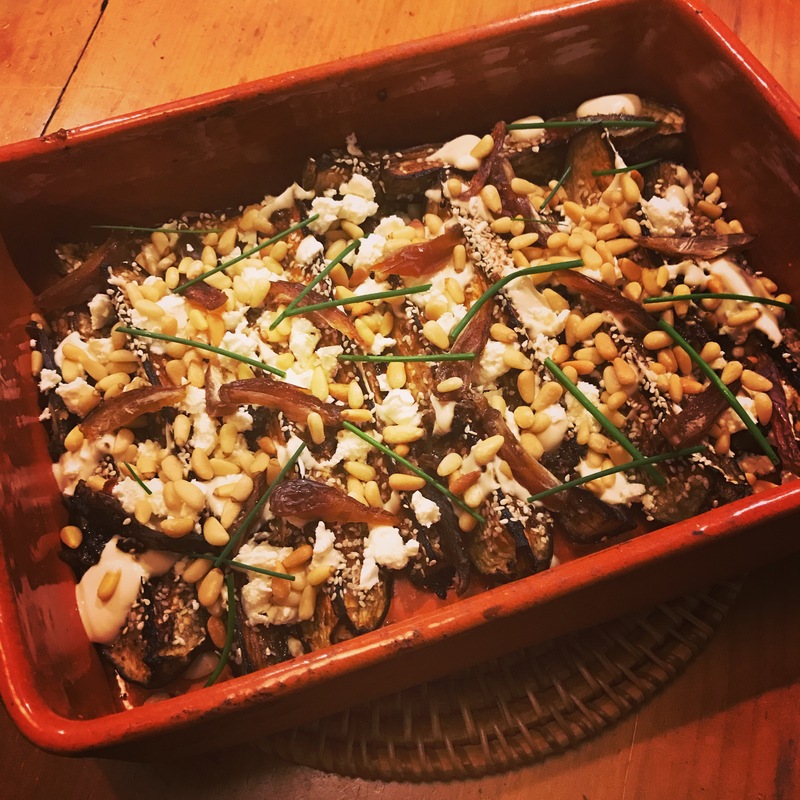 Last week I did a killer miso-baked aubergine salad with dates, feta and tahini yoghurt but didn’t bother with the crisp buckwheat topping because I couldn’t be bothered and it still had crunch from pine nuts. Not only did my quicker version work a treat, it introduced me to his miso-baked aubergine which I’ll do again just as a side. The other hit was Puy lentils with quinoa, pomegranate-roasted grapes and tomatoes with chili, mint and basil. 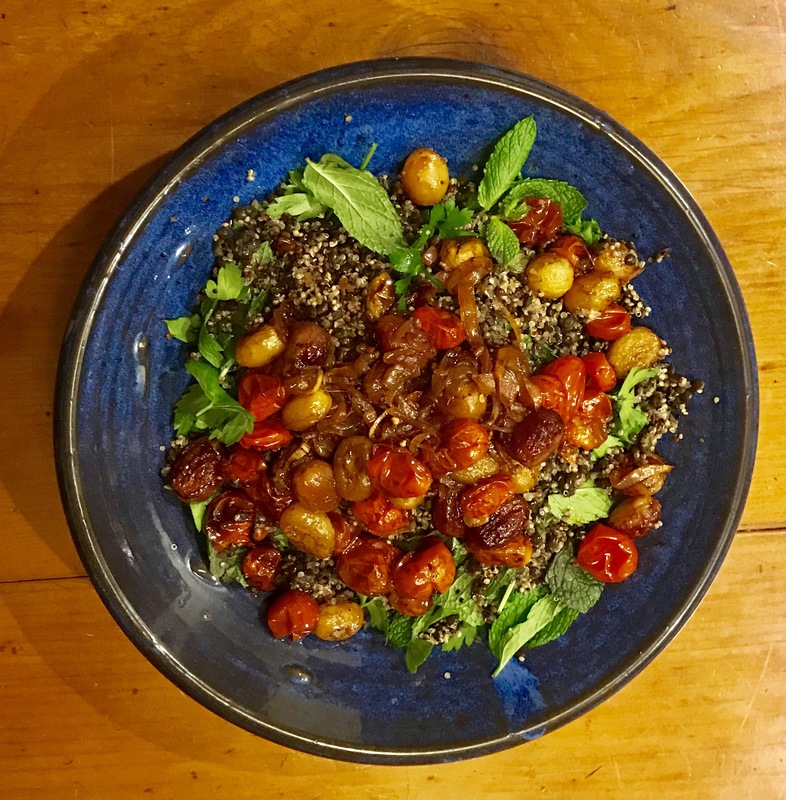 I won’t waste your time telling you how to cook lentils and quinoa because the genius of this recipe is the roasted grapes and tomatoes spooned on top of everything with their juices at the end. Put 200g of a mixture of black and green grapes and 200g cherry tomatoes, a finely sliced eschallot, 1/2 a finely chopped red chili with seeds, 2 tablesp pomegranate molasses and 4 tablesp good olive oil in a roasting dish. Stir to mix everything together then roast for about 30 minutes or more until caramelised, the skins have split and everything’s nicely juicy. Utterly delicious on their own, this sweet, tangy combination that pops like bubble wrap would be great spooned over loads of things, not least, say, grilled haloumi. Or mixed through chick peas. I’d love to hear how you’d use this mix via the comments section below. Peter Gordon is known for his mastery of ‘fusion’ cooking which can be a dangerous notion in the wrong hands. Relax, his are the right ones.